There’s quite a bit of evidence that human beings are naturally evil–watch the evening news or read the comments on pretty much any post where someone offers an opinion. But there’s also quite a bit of evidence that people are basically good. Everyone knows lots of people who are good and not too many who are bad–bank robbers and such. I know lots of people who are good too. I picked up a book in Warsaw at the POLIN Museum of the History of Polish Jews. The book contains excerpts from The Ringelblum Archive, a collection of documents and testimonies collected by Dr. Emanuel Ringelblum and his team of researchers between September 1939 and January 1943. Dr. Ringelblum did not survive, but his collection did. It is difficult to say whether this moral swamp which we see around us nowadays is the result of the abnormal conditions prevailing in the ghetto, or whether the ghetto uncovered that which had previously been covered up, masked. He goes on to describe this “moral swamp” of thefts, looting, cheating, cruelty, indifference, oppression, and corruption. The ghetto was filled with a large proportion of people who used to be good. They were good because they had homes, clothing, food and hope. Many had money, respect, freedom and safety. It’s easy to be “good” when you have these things. When these things were taken from them, or at least became scarce, their true nature came out to the surface. When I look around my community, I see a lot of good people. I also see a lot of people who have homes, clothing, food, safety and hope. Many have money, respect and freedom. But are they really good? Am I really good? If I’m honest, there’s quite a bit of fear and self-centeredness slithering around inside me. 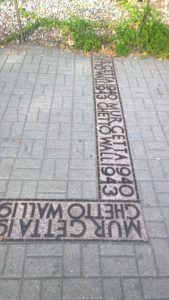 As I walked within the area that was once the Warsaw Ghetto and stood at the sight where the residents of the ghetto were put on trains bound for Treblinka, I wondered what I would have done if I had lived there in 1942. I’d like to think I would have been good, but there’s a very good chance I would not have impressed Aron Einhorn. 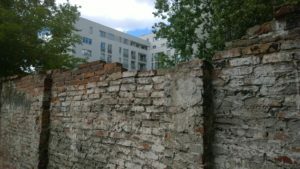 The only remnant of the wall that surrounded the Warsaw Ghetto. If the Bible is right, we are naturally evil, and we will be judged accordingly. What people don’t realize is that we will not be judged by what we’ve done. It’s not what we do that is the issue, it’s who we are. What I would have done had I lived in the Warsaw Ghetto is a much better indicator of who I really am, than living in my townhouse near a lovely golf course. I will be judged for who I am. This is pretty scary, but if the Bible is right, there’s also some good news; the best news. It’s been arranged that, if you want, you can judged as if your very nature were perfect and someone else will take the judgement that you deserve. You need only ask him to take your place.